Good morning chicklets! I hope your Saturday has been great so far--its raining here--and will continue to get better. First I must wish my good friend Adriana of Belo Horizonte and big Happy Birthday! Whoot. Its the big 3-0, 80s BABY! 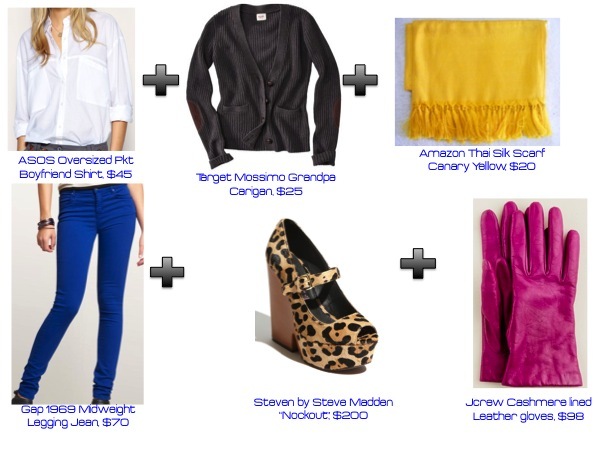 Speaking of the 80s, a trend--that is not so horrible--has resurfaced from the 80s, colored denim and bright colors. I think this trend was one of the only thing 80s fashion got right. Pair it with some animal print and bright colored leather gloves and we have an updated version of a 30 year old trend. Enjoy! I must get back to updating my blog and preparing for a coffee tasting party tonight! Whoot! 2 comments on "Colored Denim F/W 2011"
Somehow this looks are so much better than the way I used to put them together back in the 80's!